The all new Tata Nano is set to beat the best engineering minds, a task thought impossible to accomplish. 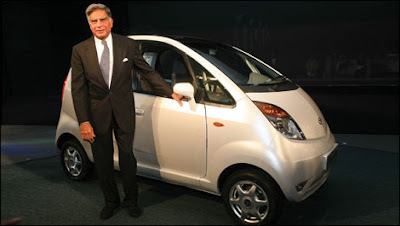 But Ratan Tata was firm on his beliefs. The car features an all-aluminum, 0.62 litre engine that runs on petrol. The engine is designed for maximized smoothness and fuel efficiency, and comes fitted with an advanced electronic management system and balance shafts to help meet this goal. The car looks cool as than many other comparing it’s price factor. Mileage expected is about 20 km in city. So that’s the real thing the Indian middle-class people are looking for good mileage, terrific looks, and yes a affordable price of Rs.1 lakh. The real price in market is expected to be about 1.3 lakh considering taxes. It is hoped that Tata will launch a diesel version soon. As far as my opinion is concerned, Tata’s should have considered making an electric car. Using gasoline or petrol will add to already increasing pollution by green house gases. Making an electric car will also help in reducing the operating cost of the vehicle. Finally, it will be great to see this car in the Indian market. People all over the world are exited about this car. Seems that the world not only India is waiting for the launch of this cool baby!